Include your little one in an asana practice that keeps the two of you happy and connected! 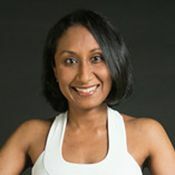 Join Kirti in tickling sun salute, swaying tree, koala grip, and an interactive downdog-plank-child’s pose vinyasa, and keep baby giggling while engaging your abdominals, exercising your thighs, and toning the vital pelvic floor area! Note: This practice is not for babies one month or under.